These sweet canapés are great for Christmas parties or after dinner with coffee. 1. Whip the cream until just starting to thicken but not yet holding its shape, then gently fold in the custard. Roughly chop the dried fruit, nuts and Turkish delight and stir into the mixture with the Marsala. Pour into a plastic container, cover and freeze for at least 3 hours. 2. Remove the ice cream from the freezer and leave to soften for 10 minutes. Line a baking tray with baking parchment. Dip a melon baller or a semi-circular measuring spoon into some hot water, then scoop up some ice cream to make a ball. 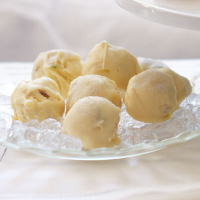 Use a teaspoon to ease the ice cream ball onto the prepared tray. Repeat to make 24 balls, well spaced on the tray. Freeze for a further 2-3 hours or until firm. 3. Gently melt the chocolate in a bowl in the microwave for 30 seconds at a time at medium power. Alternatively, place in a heatproof bowl over a pan of simmering water. Leave to cool slightly. 4. Use 2 forks to dip and roll a ball of ice cream into the chocolate, allowing any excess to drip away. Sprinkle quickly with silver stardust, if using, then place back on the parchment-lined tray. Repeat with the remaining balls, working as quickly as possible and leaving them well spaced apart – the chocolate will set almost immediately. Return the tray to the freezer and leave for at least 10 minutes, or until ready to serve.